The Country Music Hall of Fame and Museum will present Celebrate the King, a slate of special programs in August honoring Elvis Presley. This year marks the 35th anniversary of the Country Music Hall of Fame member’s death. Songs Fit for a King: Top Songwriters Remember Elvis will be hosted Aug. 11 in the museum’s Ford Theater. Jerry Chesnut (“T-R-O-U-B-L-E,” “It’s Midnight,” “Never Again”); Mac Davis (“In the Ghetto,” “Memories,” “A Little Less Conversation”); Dallas Frazier (“There Goes My Everything,” “True Love Travels on a Gravel Road,” “Wearin’ That Loved on Look”); and Billy Swan (“I Can Help”) will tell stories about their compositions. Additionally, the museum will host free Hatch Show Print demonstrations, present two films, and offer a complimentary Elvis and Country Music visitor guide. A slap bass demonstration will also be available with admission. A complete list of Elvis-themed programs is below. Presley’s ties to Nashville include recording over 200 songs at Nashville’s RCA Studio B. Presley, who died on August 16, 1977, was posthumously inducted into the Rock and Roll Hall of Fame in 1986 and the Country Music Hall of Fame in 1998. The museum currently displays Presley’s 1960 “Solid Gold” Cadillac, his 1928 Kimball Gold Piano, and archival footage from The Ed Sullivan Show. 1:00 p.m. Family Program: Make Letterpress Art with Hatch Show Print— SunTrust Community Room at the Country Music Hall of Fame and Museum. Free. 1:30 p.m. 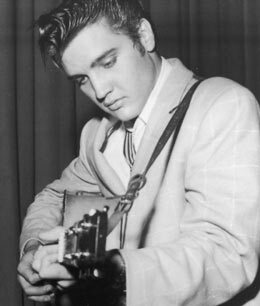 Songs Fit for a King: Top Songwriters Remember Elvis— Streamed live on countrymusichalloffame.org. Included with museum admission. Free to museum members. Limited seating. Program pass required. 2:00 p.m. Film Screening: Elvis: That’s the Way It Is – Special Edition (2001)— Filmed in 1970, this concert documentary follows a number of Elvis Presley rehearsals and performances, primarily at the International Hotel in Las Vegas. For the 2001 special edition, the film was re-edited to remove interviews and add more performances. 96 minutes. Free. 1:30 p.m. Interview: Chips Moman— In addition to production work from iconic musicians, Moman co-wrote “Luckenbach, Texas (Back to the Basics of Love),” “The Wurlitzer Prize (I Don’t Want to Get over You)” and “(Hey Won’t You Play) Another Somebody Done Somebody Wrong Song,” and “Do Right Woman.” Streamed live on countrymusichalloffame.org. Included with museum admission. Free to members. Limited seating. Program pass required. 1:00 p.m. Slap Bass Demonstration: Joe Fick— Fick performed or recorded with Sonny Burgess, James Burton, D.J. Fontana, Wanda Jackson, the Jordanaires and Boots Randolph. Fick portrayed Elvis’s bass player, Bill Black, in the 2006 Johnny Cash biopic, Walk the Line. Included with museum admission. Free to members. Limited seating. Program pass required. 2:00 p.m. Film Screening: Elvis ’56 (1987)— Tracing the rise of Presley in 1956, when the 21-year-old singer went from regional acclaim in the South to worldwide stardom. Narrated by Levon Helm. 60 minutes. Free.